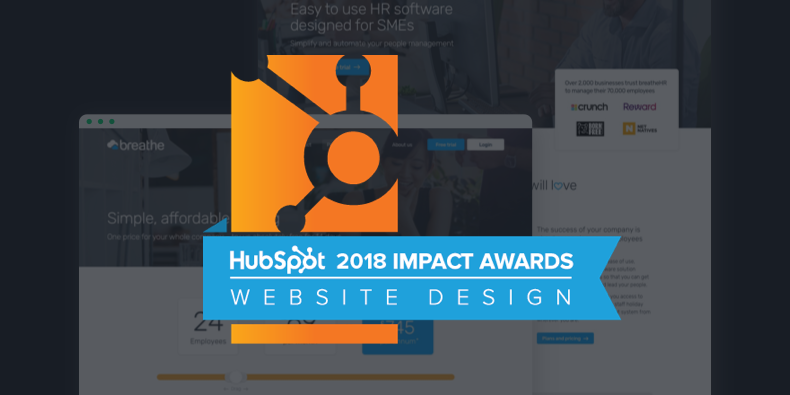 Blend has won a third HubSpot Impact Award for website design, for our work with breatheHR, the leading HR SaaS for SMEs. For any B2B tech company, after product/market fit (there has to be demand for what you make or do), your website is the single most important tool you have for generating growth. That's why we're thrilled to have been awarded our third consecutive impact award specifically for our website design. Although titled 'website design', the award actually looks much deeper than design alone to find and recognise website design that has a high level of impact on business results across marketing and sales. Judging for the award looks at what business challenges were being faced and how successfully website design has overcome them. Evidence of innovation in the solution and measurable business impact are also part of the criteria for winning. That's why we’re especially proud to win - because these awards tie our approach to website design directly to growth and business success. Why did we win the website design impact award? At Blend, our website design process encompasses strategy, structure, user experience, customer journey, SEO, CRO, design and, of course, development. Without all of these elements working together, even a good looking website will fail to drive the desired business outcomes. When working with breatheHR, as we do with any client, we made it our job to consider how all of these factors influenced their business challenges and how they could be optimised to overcome them. We aimed to remove as much friction as possible from the customer journey - so that the website is easily found, first impression are instantly positive, navigation and movement is simple, and conversion is compelling. Thanks to the data and insights provided by the breatheHR team, not to mention their large repository of excellent content, we had all the information and resources we needed to improve all of these crucial aspects of the website. The results were immediate and impressive. Within few months of starting the roll-out of the redesigned site, breatheHR's traffic levels, leads, and free trials had all increased by more than 100%. All of this on top of already impressive volumes in all areas. You can read all about the work we did together with breatheHR and the results in our impact award entry blog post. Does your website work this well? The results achieved by breatheHR are testament to the power of strategy and design to optimise a visitor's experience of a brand, build trust, and elevate their impression of a product or service. They also speak to the power of the role that conversion optimised content plays in driving up website performance across all key metrics. The combination of these two forces is behind the marketing flywheels that have created many of the best known tech success stories of recent years. If traffic, conversions or trials of your product have plateaued, a strategic redesign of your site and content could be just the thing to get them rising again.